Each year, about 40% of all food produced in the United States goes uneaten and gets thrown away. Become a part of the solution and not the problem by practicing the following simple hacks to make your produce and perishables from the supermarket last for as long as possible. To prevent your banana bunch from getting brown too quickly, simply wrap the crown with a piece of plastic wrap. For storing onions, hang them in pantyhose and make sure to never store them with potatoes. If you love green onions but can never seem to find the time to finish the entire bunch before they spoil, cut them up, place inside water bottle, and freeze them. When you want to use green onions in cooking, you can simply sprinkle them out of the water bottle directly onto a hot pan. 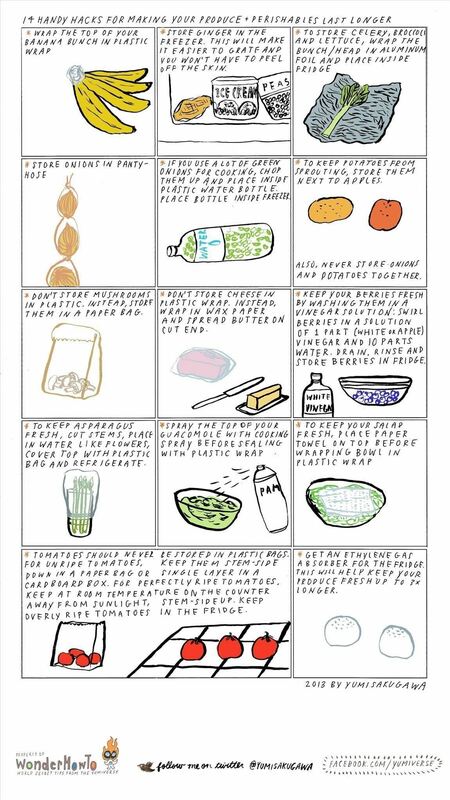 Got your own handy hacks for making your perishables last for a long time? Share with us!